Experts to speak about how genetic differences can explain how patients respond to medical treatments. "It's imperative that we, as providers, understand the rapidly evolving field of precision and genomic medicine and how pharmacogenetics can facilitate more effective drug therapy and minimize adverse drug effects,” Ayrn O'Connor, MD, FACMT, Course Organizer. 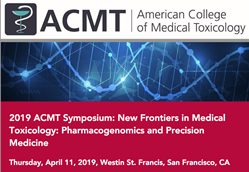 Registration is open for ACMT’s ‘New Frontiers in Medical Toxicology: Pharmacogenomics and Precision Medicine,’ a full day symposium on Thursday, April 11, 2019 at the Westin St. Francis in San Francisco, CA. Precision and genomic medicine refers to the use of genetic or molecular profiling to optimize efficiency or therapeutic benefit for particular groups of patients. Deeper understanding of genetic polymorphisms responsible for drug metabolism, transport, and elimination has had a significant clinical impact. These genetic differences explain why some patients respond favorably while others fail to respond to treatments or have life threatening adverse reactions. Featuring experts in Medical Toxicology, Bioengineering, Genetics, Biomedical Data Science, and Human Genome Research. ‘New Frontiers in Medical Toxicology: Pharmacogenomics and Precision Medicine,' precedes the 2019 ACMT Annual Scientific Meeting (April 12-14), however registration is separate for each event.